The compact Sony PXW-FS5 camera has a 4K Super35 CMOS sensor with up to 4K QFHD internal recording as well as recording DCI 4K and 2K RAW externally. Highlight features are 100fps continuous slow motion, up to 800fps burst super slow motion and internal electronic variable ND. 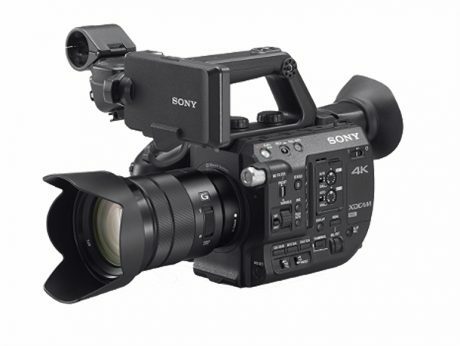 The Sony PXW-FS5 is a compact Super 35mm camcorder. This model rounds out Sony’s line of 4K professional cameras, filling an important niche between cameras like Sony’s PXW-FS7 and the NEX-FS700, or complementing Sony’s consumer a7R II and a7S II models. The PXW-FS5 is ergonomically designed for versatile, hand-held shooting. The lightweight body has excellent weight balance, ensuring reliability and all-day comfort. It can be used in almost any location, even airborne when mounted on a drone. A variety of shooting angles is possible with the one-touch rotatable grip. All key controls are at the user’s fingertips, allowing for shooting flexibility and instant switching between low or high angle shooting. Users can attach the 3.5-inch type LCD panel to different positions on the handle or the compact camera body, further supporting easy handheld operation and customized shooting. Capable of 4K XAVC high-definition shooting, the camera’s Super35 Exmor™ CMOS sensor incorporates 11.6 million pixels and 8.3 million effective pixels. The high sensitivity and large size of the sensor delivers background defocus, increased low-light sensitivity and lower image noise. High-quality imagery is further ensured by high frame rate cache recording at 10-bit 4:2:2 Full HD and a high frame rate of up to 240 fps, in 8 second bursts, which makes 1/10 times Super Slow Motion possible without sacrificing bit depth or loss of image quality. The PXW-FS5 is the first Super35 camcorder to feature built-in electronic variable ND filters, further expanding the depth of field representation by the large-format sensor and enabling flexible exposure control. Integrating easily with other camera lenses, Sony’s a Mount System offers compatibility with both Sony and third-party lenses. The PXW-FS5’s E-mount can take virtually any lens, such as SLR lenses via an adapter, as well as Sony’s E-mount and A-mount lenses, ensuring the camera adapts to multiple environments. Sony’s a Mount System and its enhanced interfaces include 3G-SDI, HDMI output and dual SD card slots. Also equipped with Wi-Fi and a wired LAN terminal, the PXW-FS5 features enhanced network functions such as file transfer and streaming transmission.